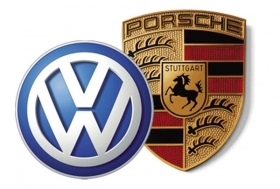 BERLIN (Bloomberg) -- Volkswagen AG's merger with Porsche SE is unlikely to be derailed by U.S. investor lawsuits, even though its completion in 2011 appears “doubtful,” according to the German state shareholder with veto power. McAllister, who took the helm of the state that holds 20 percent of Wolfsburg-based VW's common stock, said his government has abandoned plans to sell any VW shares in 2011 because of better than anticipated tax-revenue estimates. VW Chief Executive Officer Martin Winterkorn said last month that the combination with Porsche planned for next year may be put on hold until U.S. lawsuits are resolved. Volkswagen agreed to join with Porsche in August 2009 after the 911 sports-car maker's debt tripled to more than 10 billion euros ($13.9 billion) following a failed bid to buy Europe's largest carmaker by securing stock through options trading. VW has since bought 49.9 percent of Porsche's operating unit for 3.9 billion euros, setting the stage for a merger. Porsche is being sued by U.S.-based short sellers of VW stock who claim the sports-car maker secretly cornered the market in VW shares and later caused them more than $1 billion in losses. VW's merger with Porsche is also being hampered by negotiations with German tax authorities over the tax-exempt status of profits from Porsche's options transactions. “Initially, we were expecting that the integration of Porsche would be carried out in 2011,” McAllister said in the Nov. 5 interview, adding that the timetable now looks “doubtful.” “A possible sale of VW shares in 2011 is definitely no longer on the agenda” for Lower Saxony, he said. A Lower Saxony state official said in August that completion of the merger might boost Lower Saxony's VW stake to more than 20 percent. Under Germany's so-called Volkswagen law, Lower Saxony may block major decisions by the carmaker. Porsche's holding company owns 50.7 percent of VW's ordinary shares. Qatar Holding LLC, part of the country's sovereign wealth fund, is the third- largest owner with a 17 percent stake.